Today was my first real Saturday in my house. Last weekend my mum was here and the weekend before my army of friends was helping me to move in. I was a little worried I’d go stir crazy by myself but I’ve actually had a grand day. Granted I did see one friend and his girls as I discovered I’m too short to change the battery in my smoke alarm and it was going off all through the night last night. But that was just a short visit. For the rest of the day I entertained myself! I went to the gym (and in the process discovered there is no quick way to walk there) and the library (2 new books!) And after lunch went to aldi to get some groceries. However…I then got a sewing urge. 4 hours later I have made 2 skirts. The first was a bit of a flop as I followed the measurements on the pattern I found on Pinterest which were WRONG! But the second I did without a pattern, just making it up as I went along and I have to say I’m chuffed with the result! You can’t tell but the fabric is actually a bedsheet that I got on sale. I think it’s a pretty pattern. It has 2 darts at the front to give it shape, french seams (cos I learned how to do them after watching The Great British Sewing Bee) and a zip at the back. Yay me!! Another few Saturday evenings like this and I’ll have a whole new wardrobe! Hmm. After saying yesterday that I don’t “do” favourites, today is yet another shining example. I absolutely, 100%, categorically adore books. I love reading, and have done since I was ever so little. Check out my chubby cheeks! 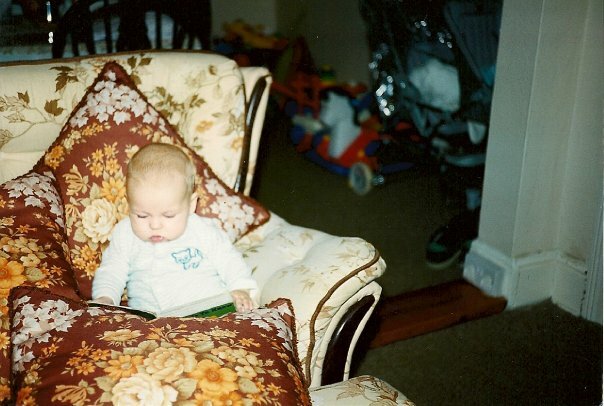 I’m four months old in that picture, so if you want to be technical I wasn’t actually reading…but ever since I was old enough to hold onto a book, I’ve done it. Growing up I’d have books everywhere…in the living room (to read whilst I simultaneously watched TV), at the computer (to read whilst waiting for things to load/avoid homework), in the bathroom. I even read at the dinner table, when my mum would allow me to. It wasn’t just books that I read…I’d even read the backs of cereal boxes at breakfast, and have the subtitles up on the TV. When I was little we would go to the library every few weeks, sometimes even once a week, to get new books. I completed the reading challenge when I was about 8 or 9, having read 100 books and done a little interview with the librarian after each one to get my stickers. My brother did it too and we both went to an awards evening where we got certificates and a free signed book from a poet called John Foster. And so we approach the monumental task of considering my favourite book. Below is a list of [some of] books that I plan on giving to/reading to/reading with my daughter when I have one. There are just too many wonderful books in my memory…far more than are listed above. Books are just so special. I could never use a Kindle or read e-books, because to actually physically hold a book is just a great feeling. I love going to the library and pondering what I’m going to take home and try this time, what new favourite I might find. What is your favourite book? Maybe I’ll try it and it’ll be my new favourite!